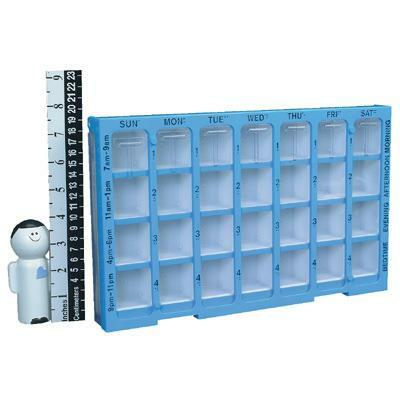 The Medication Organiser can be filled for an entire week with large capsules and tablets that normally would not fit inside standard size medication organisers. Inside has a plastic tray with 28 compartments. The top of the organiser has the days of the week, starting with Sunday from left to right. The right side of the organiser has Morning, Afternoon, Evening, and Bedtime printed up and down, and the left side has suggested time periods for taking meds printed up and down. Clear plastic compartments allow easy viewing of meds without opening the organiser. Clean with mild detergent and water.